This article is about cutting hole in drywall. Cutting a hole in drywall is an easy techniques needed when installing new electrical outlets, switches or other fixtures. In addition, you have to cut a round or a rectangular hole around a damaged area in drywall, to ease the repairing procedures. Even though cutting a hole in sheetrock is a straight forward process, you have to use the right tools and techniques to get the job done as a professional. Therefore, we recommend you to work with great care and to follow our step by step tutorial, before starting your project. Step 1: Measure the location of the fixture and trace its contour on the drywall sheet. Therefore use a tape measure to determine the distance from the left edge where you will install the panel, to the left and right side of the fixture. In addition, measure the distance from the bottom edge of where you will hand the drywall sheet, to the bottom and top of the fixture. Having these dimensions in mind, use a T-square and a pencil to draw the location of the hole on a drywall sheet. Using accurate measurements plays an essential role for your project. Step 2: Use a drill machinery and a large drill bit to make 4 holes around the rectangle. As you can see in the image, the holes should be drilled in the interior of the rectangle, as close as possible to the cut lines. Smart tip: If you find this method better, you could drill the holes in the four corners of the rectangle. Remember that the pilot holes should be large enough to use a jigsaw or a keyhole saw. Step 3: Use a jigsaw or a drywall saw to cut the patch in drywall, positioning the blade in the starting holes. Work with great care and make sure you cut along the guidance lines. Smart tip: Wear a respiratory mask while cutting holes in drywall, to avoid inhaling the dust. Cutting the holes a little too small is better too big, as you can easily shave the edges with a rasp. Step 4: After you have cut the hole in drywall, you have to check if it fits into position. In addition, install the fixture to see if you have cut the hole properly. Smart tip: You can also cut holes directly into an existing drywall, but you have to pay attention to several aspects. Before making the cuts, you should make sure that there no pipes or wires inside the drywall. Step 1: Cutting round holes in drywall can be done in several ways. On one hand, you can use an adjustable hole saw drill bit attached to a drill machinery. This is one of the quickest and most accurate ways of drilling round holes in drywall. We recommend using this method for small and medium sized round holes, as you will get the job done properly. First you need to measure the distance from the edges where you will hang the drywall board to the center of the hole. Next, use a T-square and mark the center of the hole on the drywall sheet. Step 2: Connect the hole saw drill bit to a drill machinery with torque control. Next, place the tip of the frill exactly over the center of the hole and press the start button. In order to get an accurate hole, we recommend you to use an average speed and to make the cut progressively. Smart tip: Don’t press too much the hole saw in the drywall sheet, as it might get stuck in the gypsum. It is essential to have patience while cutting the hole, otherwise you won’t obtain a professional result. Step 3: If you have followed our tips, you should be able to obtain a nice and accurate hole. After you have finished the procedure, you have to check if the fixture fits in the hole and then hang the sheetrock to the wooden studs. Smart tip: You can also cut round holes by using a circle cutter. Fix the center of the cutter, adjust the arm to the radius of the hole and score the circle (do this on both sides of the sheet). Lastly, tap the circle with hammer and check if the fixture fits in the hole. If you have to cut a hole to an existing drywall, you should use other technique. Therefore, you should first use the fixture and draw its contour, by using a pencil. Smart tip: Before drawing the trace, you should make sure there are no wires or pipes inside the drywall. In addition, you should ensure the location of the fixture is proper. Next, use a drywall saw to cut the hole in drywall. In order to get an accurate round hole, you should first punch the drywall and then use back-and-forth motion to cut the drywall. 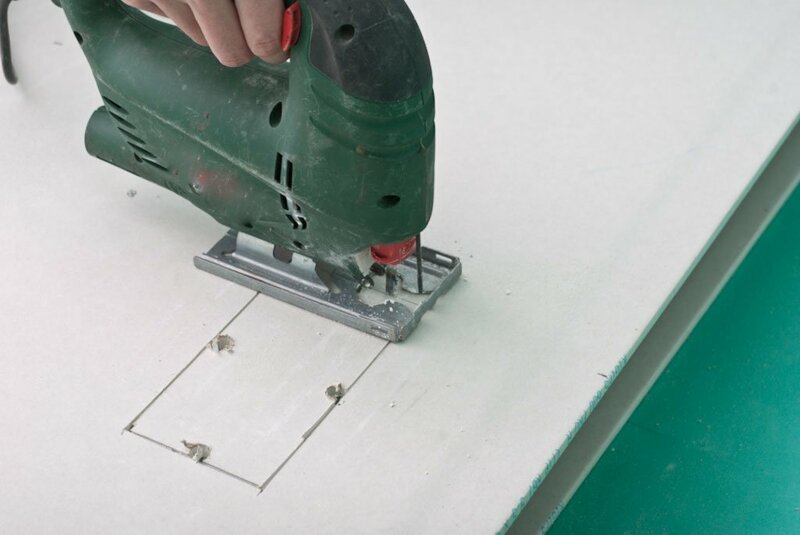 Smart tip: For cutting round holes, you can also use a jigsaw, before hanging the sheetrock to the wooden studs. Thank you for reading our article about cutting holes in drywall and we recommend you to check out the rest of our projects. Don’t forget to share our articles with your friends by using the social media widgets.